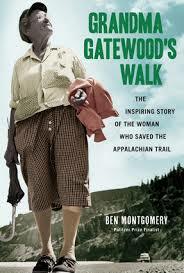 Back in 1955 a 67-year old woman from Ohio named Emma Gatewood decided to hike the Appalachian Trail on her own. Widowed with children (11 of them) who were grown and gone, Emma was strong and healthy and had been an active outdoors person all her life. She’d first read about the trail a few years prior and just got smitten with the idea of walking the whole thing. When she found out that only a very few men and no women had done it she became determined. So a few years later with less than 20 pounds of carry weight and with sneakers for shoes (Keds) she set off from a place in Georgia thinking she’d make it to Maine in a few months. She made it – and was written up, with photos, in many newspapers and magazines throughout the US. The story is well documented. The story is well written and easy-reading. It moves fast and feels like it’s winding up about midway, but no, there is plenty of interesting material for the whole book. Very enjoyable read.